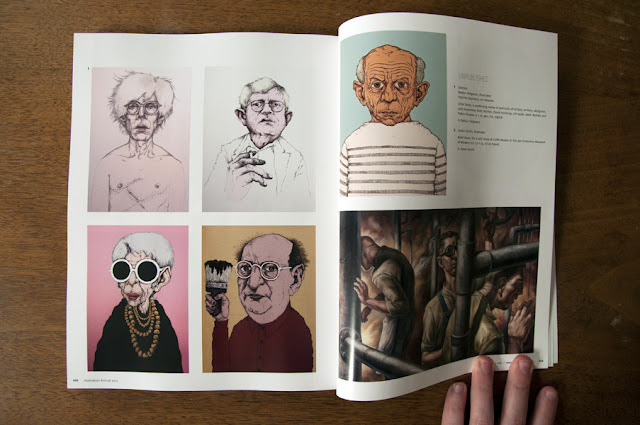 Baldur's spread in Communication Arts Illustration Annual. San Francisco based illustrator and painter Baldur Helgason is a featured artist in Communication Arts Illustration Annual #54. The spread consists of his series of famous artist and celebrity portraits. Baldur is an illustrator and fine artist based out of San Francisco. He has created a unique style using etches, paint, ink, digital imagery, and other mediums to create his illustrations and paintings. Baldur graduated from the Academy of Art University.